We are lucky enough to live in walking distance to a park and the beach. Last summer was our first real summer with our daughter at the beach. I quickly realized that taking the stroller to the beach with a couple of towels and some toys, was not really working. So for this summer we got a wagon to make it easier to haul everything to the beach. 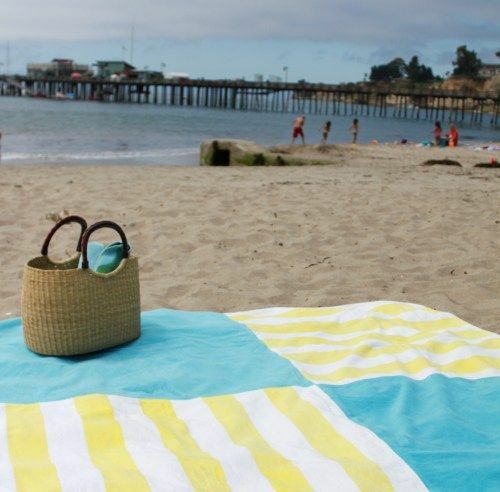 And I found this fun beach/picnic blanket tutorial on pinterest, that you make using old towels. I had a lot of old towels that I saved for a crafting. They were pretty heavy towels, so it was a little tough to sew, I actually broke the needle on my sewing machine and had to take the blanket over to my parents house and use my Mom's sewing machine to finish it.